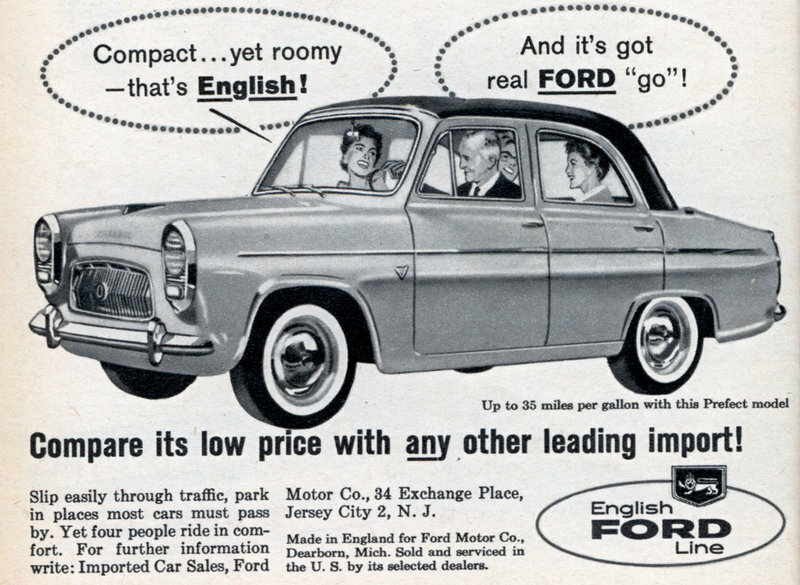 Compact... yet roomy - that's English! 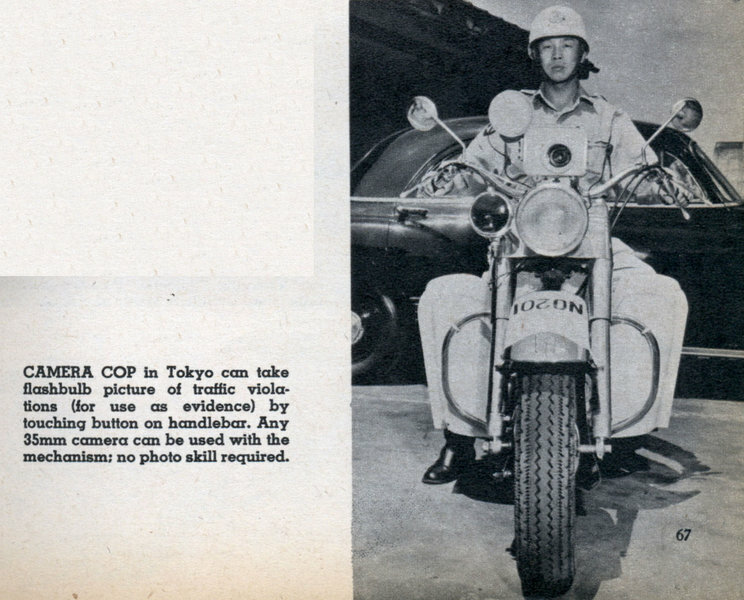 CAMERA COP In Tokyo can take flashbulb picture of traffic violations (for use as evidence) by touching button on handlebar. Any 35mm camera can be used with the mechanism; no photo skill required. 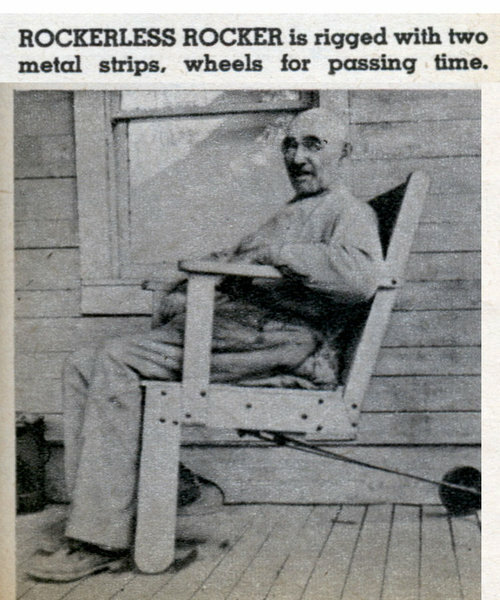 ROCKERLESS ROCKER is rigged with two metal strips, wheels for passing time. 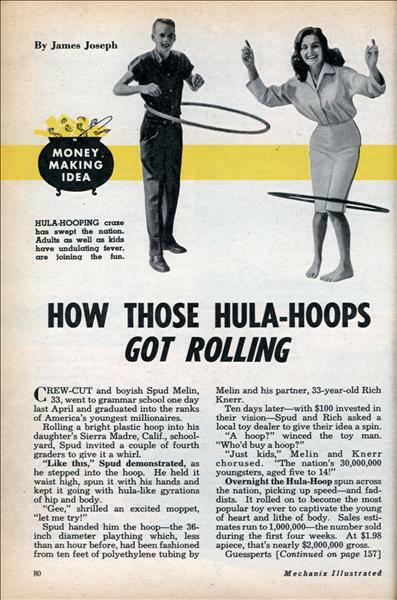 WIN $5 for year invention idea. 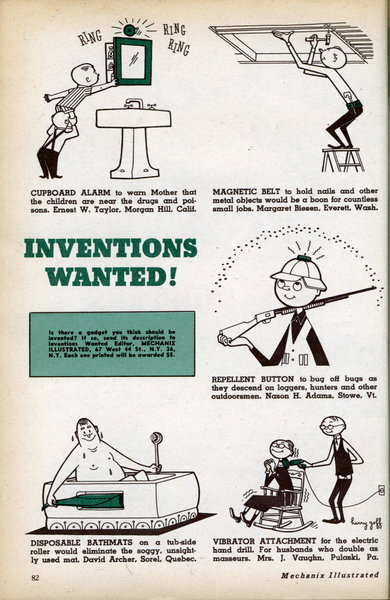 Describe en a postcard and mail to Inventions Wanted Editor, Mechanix Illustrated, 87 W. 44th St, New York, N.Y. 10036. 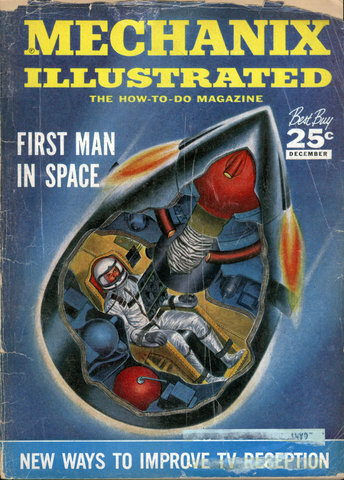 Each idea that we publish wins $5. FISH FOOD in time-release capsules that would dissolve over several days or weeks. Philip F. Sidotti, Glassboro. N. J. ICE CREAM freezer that could be hooked up to an exercise bike to make your perspiration more worthwhile. Ross White, Hueytown. 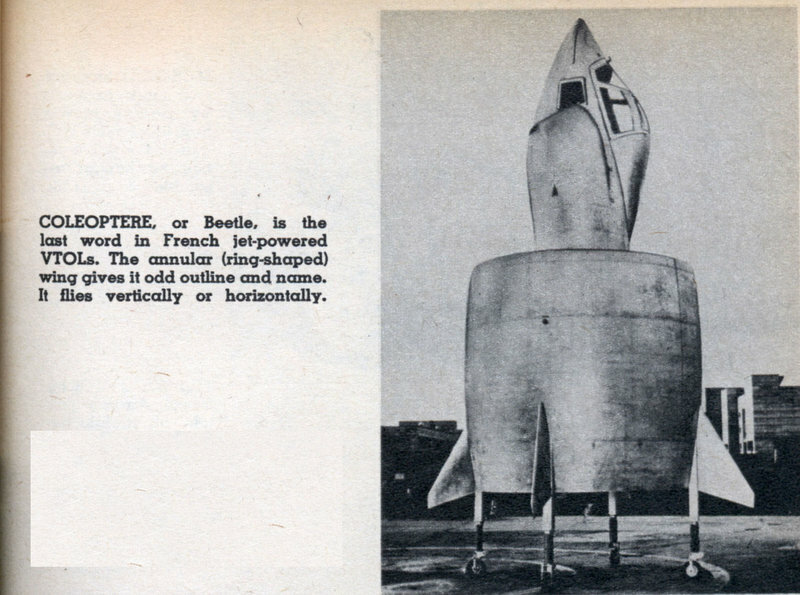 Ala.
COLEOPTERE, or Beetle, is the last word in French jet-powered VTOLs. The annular (ring-shaped) wing gives it odd outline and name. 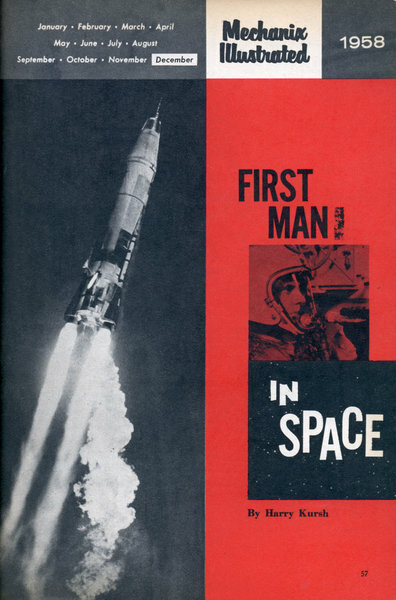 It flies vertically or horizontally. 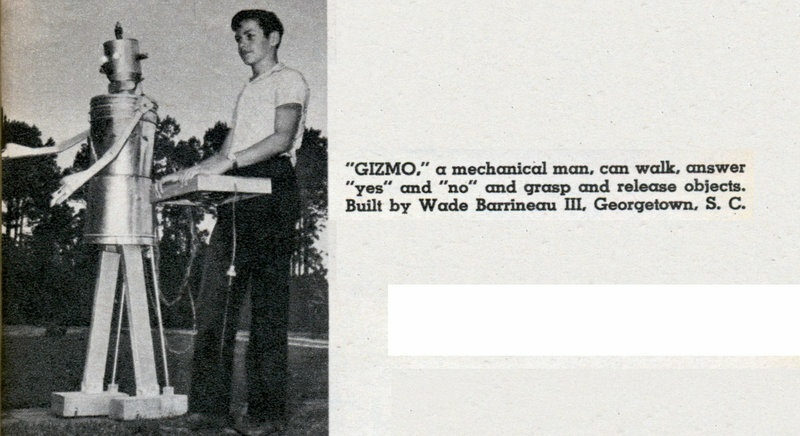 Here is the June 1956 article and the November 1956 article (with the plans) “GIZMO.” a mechanical man. 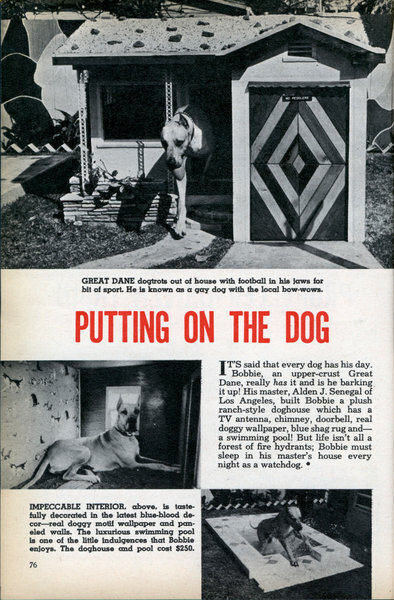 can walk, answer “yes” and “no” and grasp and release objects. 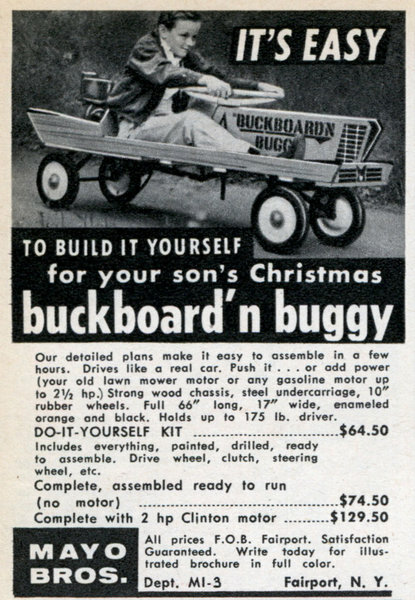 Built by Wade Barrineau III, Georgetown. 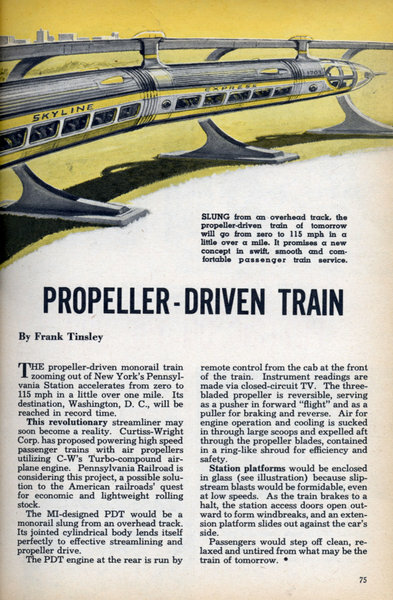 S. C.
By Frank Tinsley THE propeller-driven monorail train zooming out of New York's Pennsylvania Station accelerates from zero to 115 mph in a little over one mile. Its destination, Washington, D. C, will be reached in record time. This revolutionary streamliner may soon become a reality. 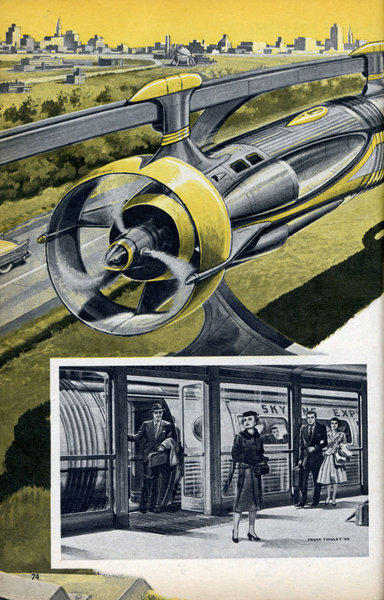 Curtiss-Wright Corp. has proposed powering high speed passenger trains with air propellers utilizing C-W's Turbo-compound airplane engine. Pennsylvania Railroad is considering this project, a possible solution to the American railroads' quest for economic and lightweight rolling stock. 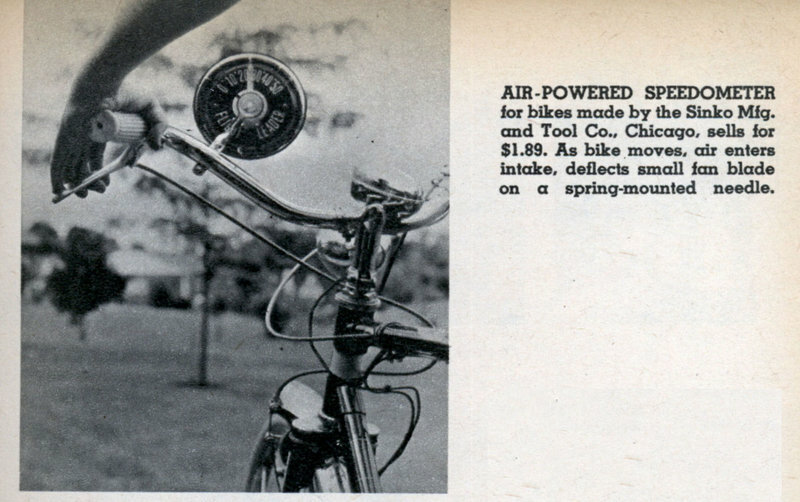 AIR-POWERED SPEEDOMETER for bikes made by the Sinko Mfg. 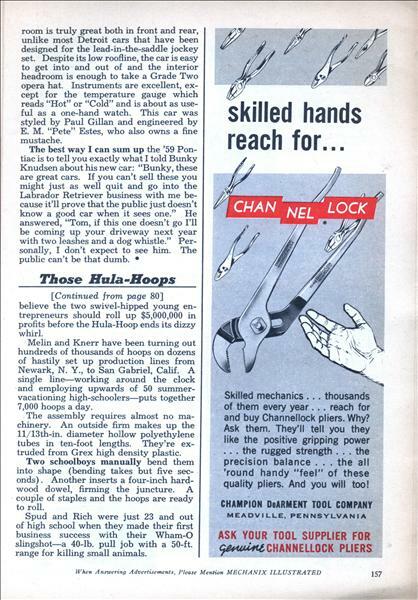 and Tool Co., Chicago sells for $1.89. As bike moves, air enters intake, deflects small fan blade on a spring-mounted needle. 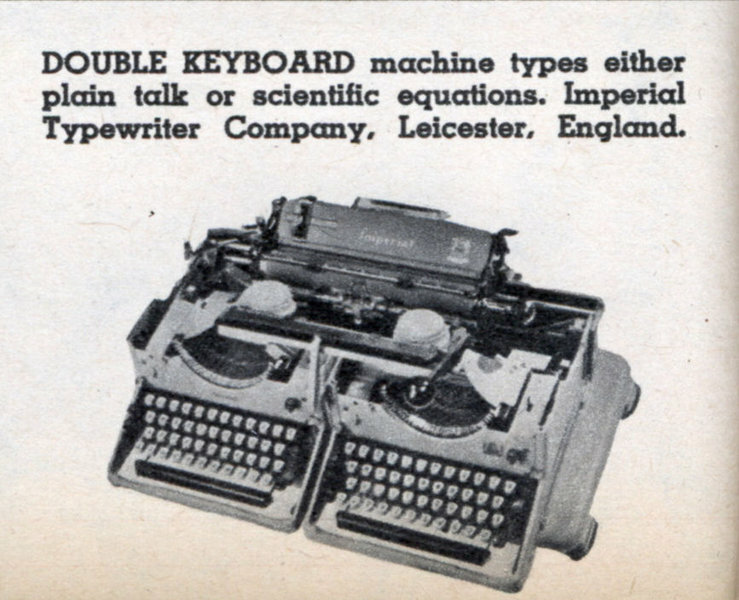 DOUBLE KEYBOARD machine types either plain talk or scientific equations. Imperial Typewriter Company, Leicester, England. 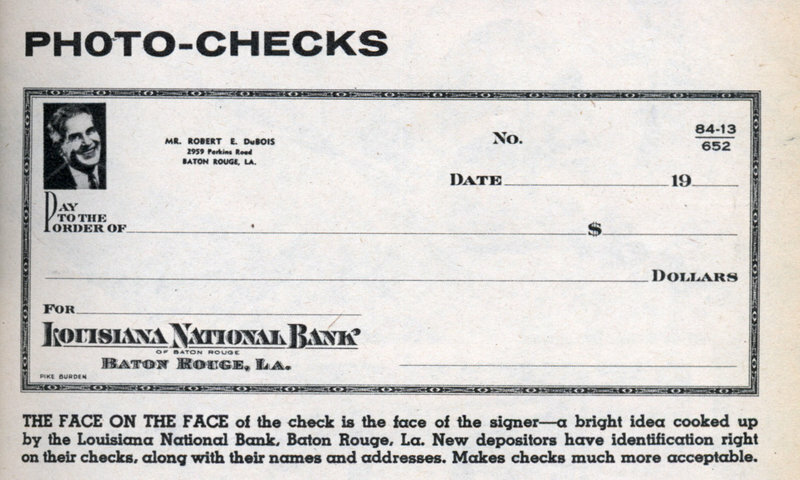 PHOTO-CHECKS THE FACE ON THE FACE of the check is the face of the signerâ€”a bright idea cooked up by the Louisiana National Bank, Baton Rouge, La. New depositors have identification right on their checks, along with their names and addresses. Makes checks much more acceptable. 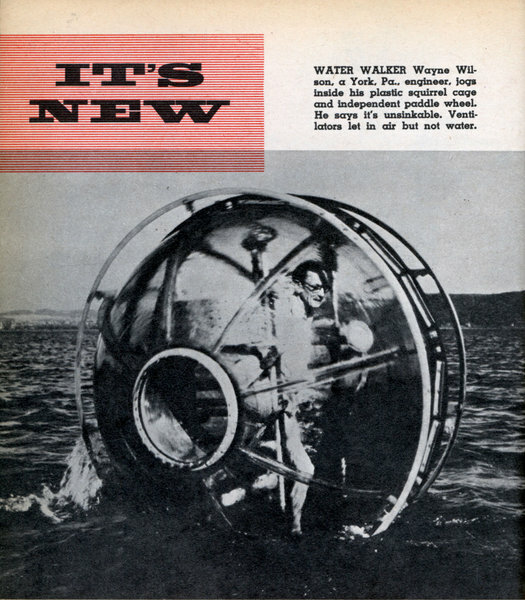 WATER WALKER Wayne Wilson, a York, Pa., engineer, jogs inside his plastic squirrel cage and independent paddle wheel. He says it’s unsinkable. Ventilators let in air but not water. 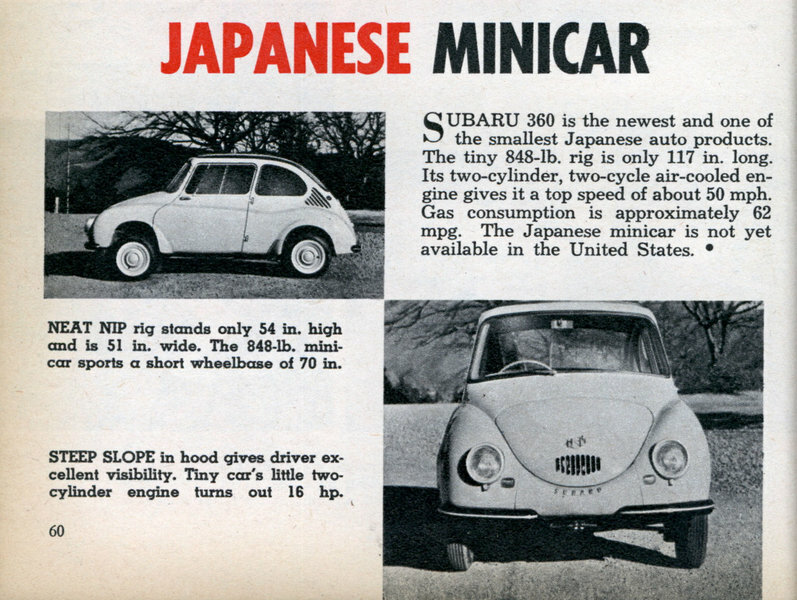 Japanese Minicar SUBARU 360 is the newest and one of the smallest Japanese auto products. The tiny 848-lb. rig is only 117 in. long. Its two-cylinder, two-cycle air-cooled engine gives it a top speed of about 50 mph. Gas consumption is approximately 62 mpg. 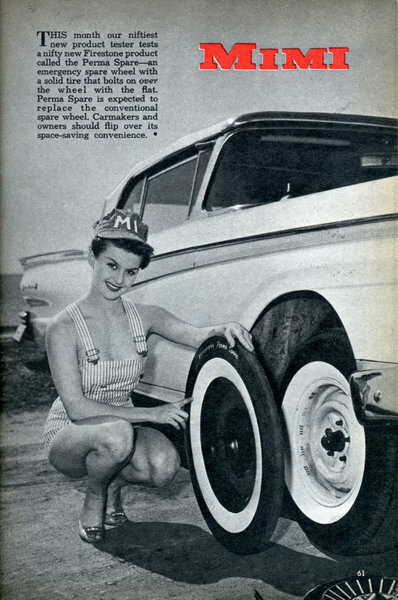 The Japanese minicar is not yet available in the United States. GOOFY CAR has cut-down Chevy hood. 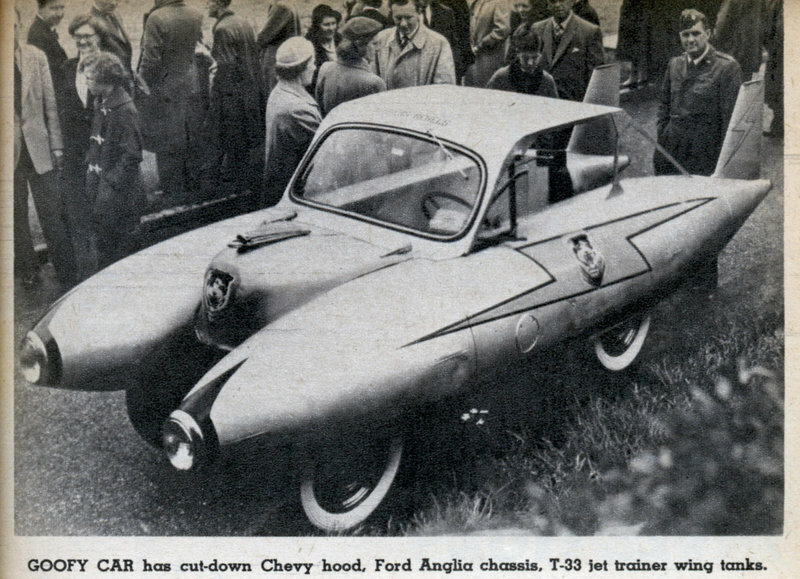 Ford Anglia chassis, T-33 jet trainer wing tanks. WHISKER SAVER is called ash guard and it protects user against brush fires.